The Boston Public Market on Hanover Street will add a taproom, perhaps as early as this summer. Something’s brewing at Boston Public Market. On Wednesday, Casey Hogan, senior operations manager of new vendor relations for the downtown marketplace, tweeted a “Request For Proposals” seeking a craft brew vendor to set up a taproom onsite, a place where visitors could grab growlers, cans, and bottles of beer to take home, or sit down to enjoy a pint. According to details of the RFP included in her tweet, the market is looking for a Massachusetts-based or New England-based beer maker to join its lineup of locally sourced food and drink vendors inside the Hanover Street building. Boston Public Market, which opened in the summer of 2015, features more than 35 vendors selling an array of food items like bread, cheese, fish, and vegetables. It’s also home to small eateries that offer prepared meals to-go. 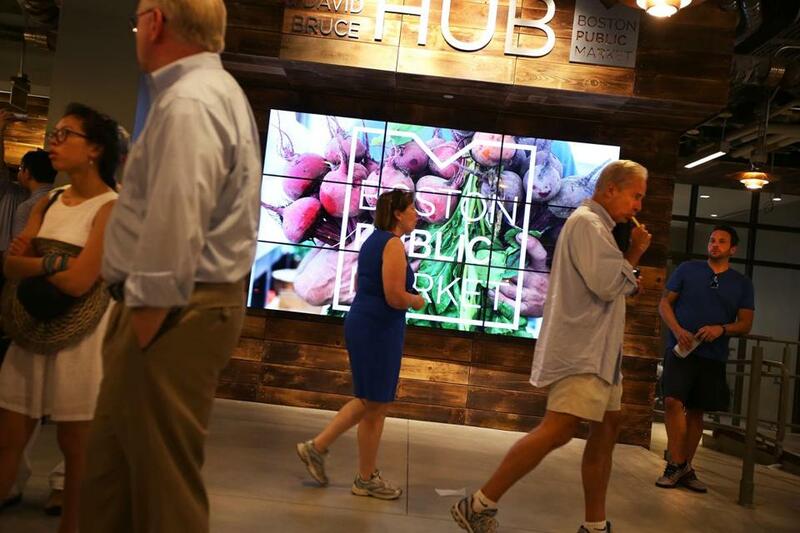 In a telephone interview Thursday, Hogan said the idea of bringing a taproom to the year-round indoor market is a new concept for the Boston Public Market Association, the nonprofit organization that operates the space. The market has hosted “pop up” events featuring local brewers as well as “Sip and Shop” events, but this would be its first permanent venture. Hogan said interested beer-makers will need to submit their taproom ideas by mid-February for consideration. From there, the Boston Public Market Association will review the proposals, conduct interviews, and make its final decision on which company from the region — and there are certainly plenty — will be awarded the opportunity to open up shop. Candidates selected for interviews will be based on a “compelling vision to make the taproom an innovative, welcoming, and sustainable destination; streamlined operations; relevant past experience; attractive infrastructure; excellent hospitality; and an enthusiasm working with and supporting local producers across New England,” according to the RFP. Hogan said the area where the taproom would be located is approximately 590 square feet, with a capacity to expand to 1,300 square feet. She said right now the space, which is in the southeast corner of the market, just off the Rose Kennedy Greenway, is used as a children’s play area, which will be moved to another section of the market. There’s no set timeline for when a taproom could actually open and be introduced to the market, Hogan said, but ideally in her mind it would all come together by the summer. Hogan said while the RFP was only recently released, there’s already a bit of buzz about the project.